Kentucky fans, rejoice–basketball season is upon us! This weekend is Big Blue Madness, which kicks off this year’s basketball season. 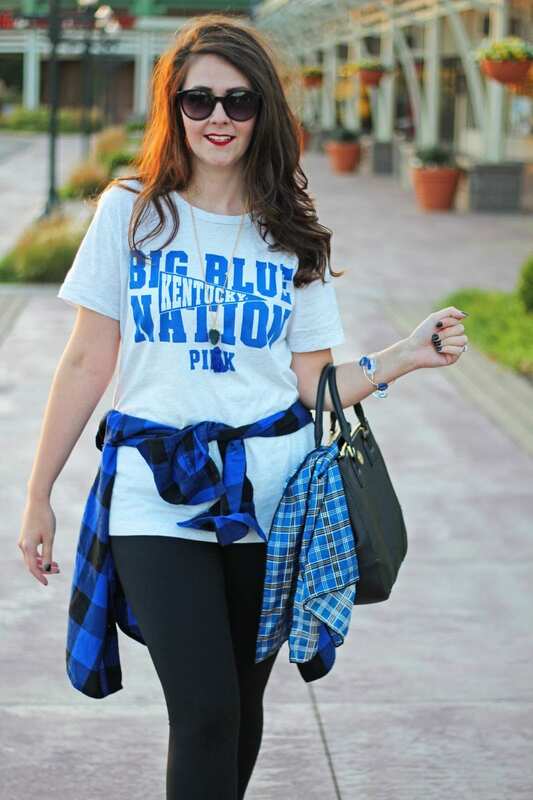 So Nicole from What Nicole Wore and I decided to showcase some outfits you can wear for Kentucky gamedays. 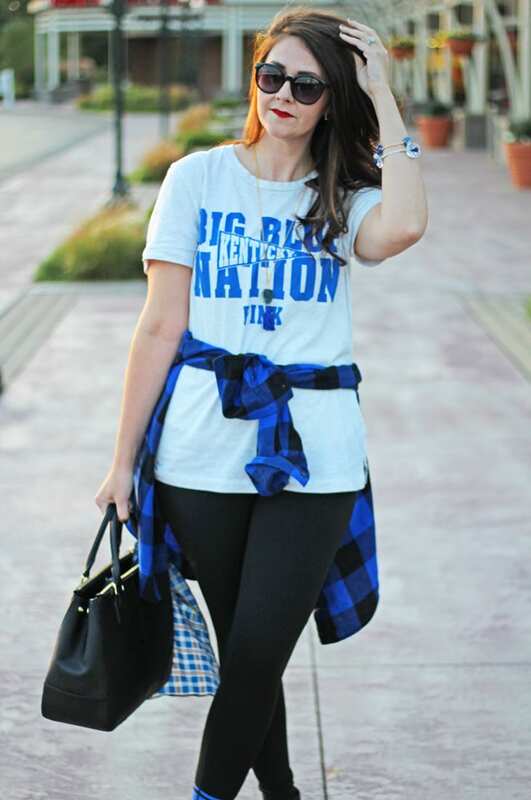 If you’ve ever asked yourself, “What should I wear to the basketball game?,” then this post is for you. Really, though, these looks work for any team. 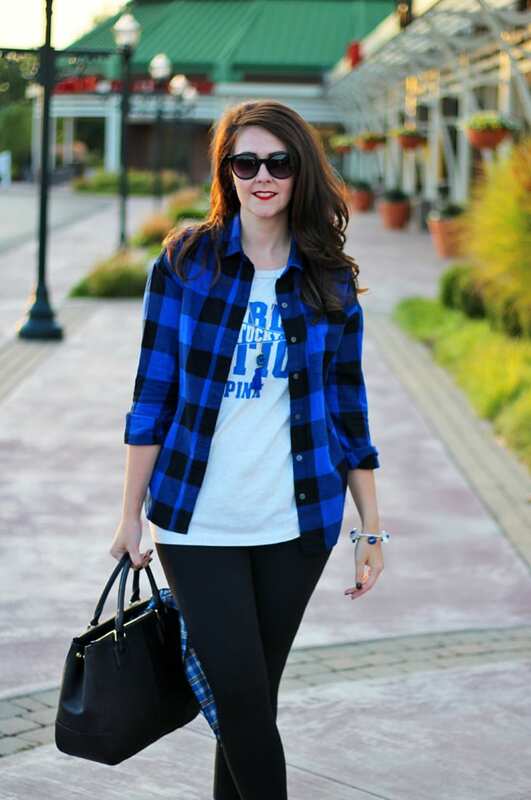 Just swap in similar pieces that match your team colors and you’re good to go! You can check out Nicole’s outfit here. If you’ve been around a while, then you KNOW I’m a HUGE Kentucky Wildcats fan!!! I actually graduated from the University of Kentucky College of Law:) I was even at the NCAA championship game we won in 2012. . .I bought tickets the night before the game, and we drove down to New Orleans to watch the game. Roundtrip, we were gone 36 hours. It was crazy but memorable! 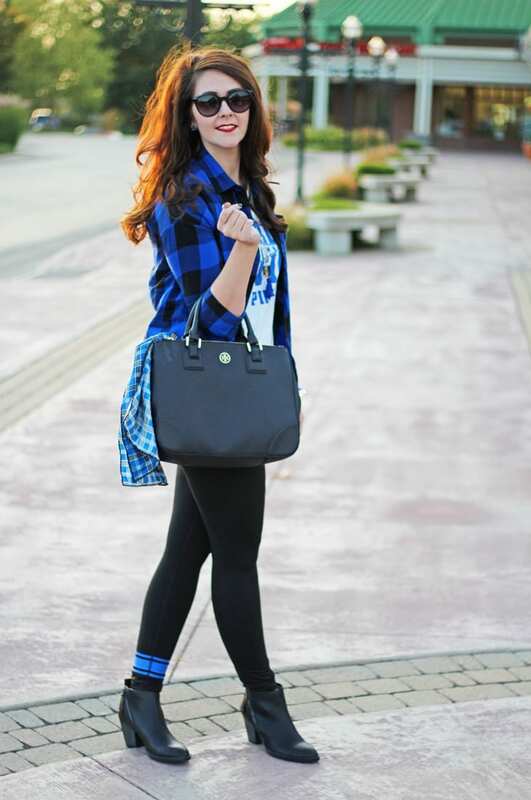 When I’m heading to a basketball or football game, I like to dress in an outfit that is trendy but comfortable to sit in. 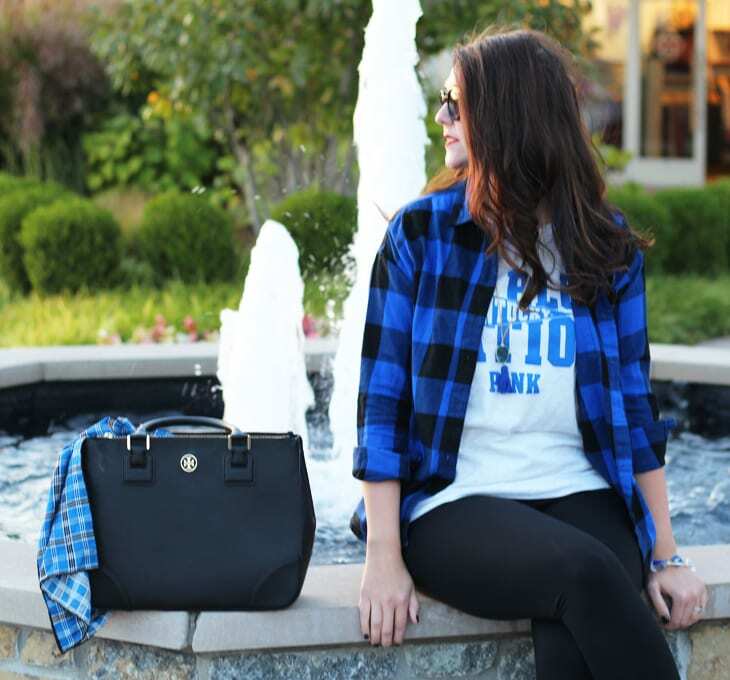 This take on the athleisure trend totally works for gameday. My base pieces are a UK tunic tee and matching yoga pants from Victoria’s Secret Pink. These are the ultimate yoga pants and they are amazing. This pair is actually reversible–the other side is plain black with a Kentucky blue waistband. I also like to layer, because you never know what the temperature of a venue is going to be like. 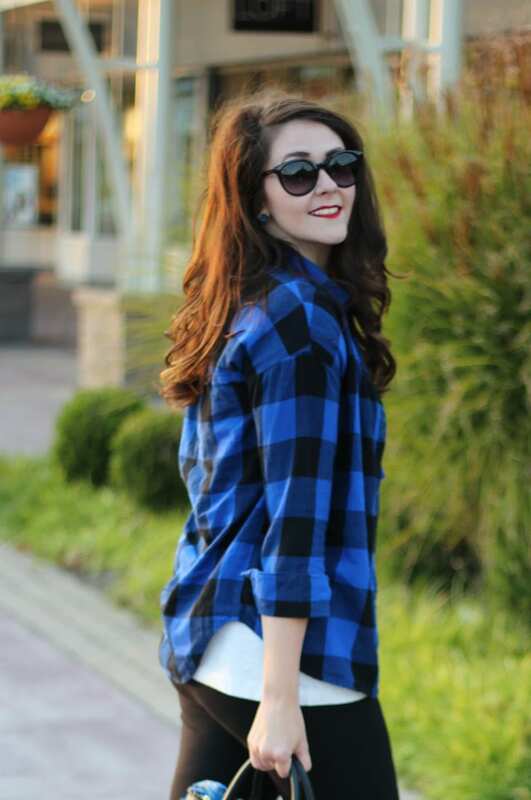 So I threw on a blue buffalo plaid button-up overtop my base pieces, You can always take the button-up plaid shirt off and tie it around your waist. Yes, I know that’s totally a 90s trend, but it’s cool again. To upgrade this look, I paired it with my new favorite black ankle boots. These are so cute because they have the diagonal zipper on both sides of the boots, and even better, they’re currently on sale! I also grabbed my black Tory Burch Robinson Tote. 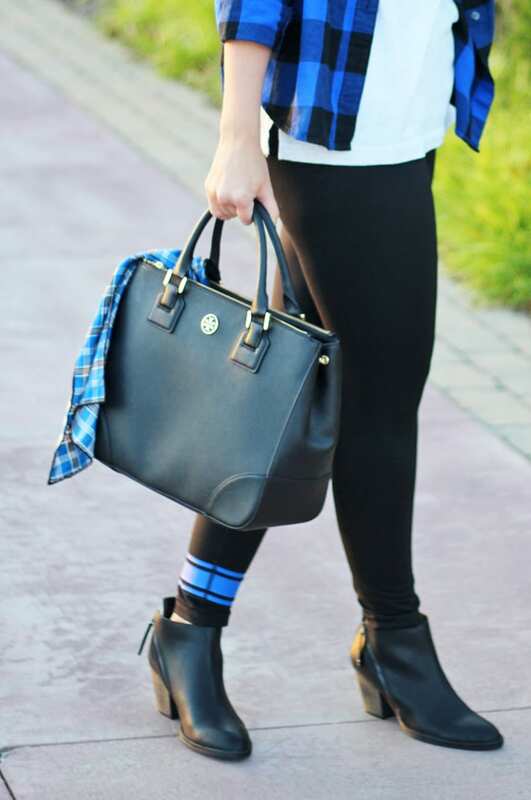 This tote is a piece from the Tory Burch Outlet and was 40% off. FYI, the Tory Burch Outlet ships, so you can call and place an order! It looks so cute with the Kentucky plaid silk scarf tucked in. I recommend keeping your jewelry relatively simple. I added some Kentucky bangles, a drusy necklace, and some matching drusy studs. And in case you’re wondering, my nails are black with glitter. It’s SNS dip color CT8. I wanted something for this month that was perfect for Halloween. 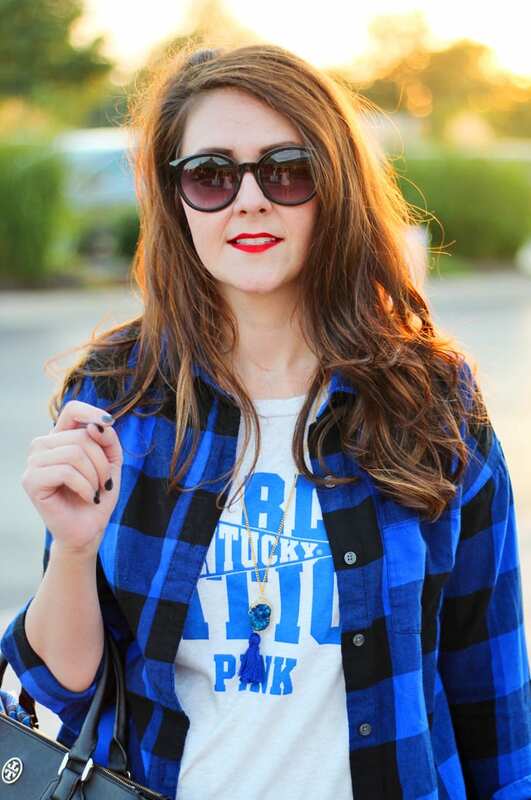 Don’t forget to visit What Nicole Wore to see her Kentucky gameday outfit. 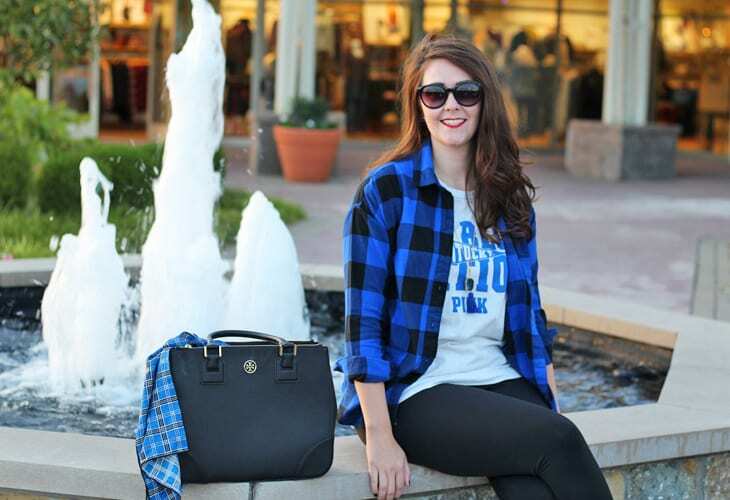 You can catch some of my other gameday outfits here and here.